Adi Contractor is a con man who makes his money playing along with Western stereotypes of India. He is the guy you turn to if you are a foreigner who wants “tedi unglee jobs” done in this country. A supply of elephants, a group of beggars – he will arrange them all for you. So when he is asked to find a fakir with the ability to survive burying his head in the ground for hours, he agrees. After a fruitless search in Varanasi, Adi finds his ‘holy man’ in his home city Mumbai. Sattar Ali is nothing but a cash cow for Adi, but when the poor man is put up as an exhibit in an art gallery in Venice, you know of course that at some point the hero’s apathy will turn to something else. Based on a story by Homi Adajania (who we now know as the director of Being Cyrus, Cocktail and Finding Fanny), The Fakir of Venice has been stalled for a decade. It had a festival premiere 10 years back, but has come to mainstream Indian theatres only this week. The delay is not its only problem. Although at a concept level it is an interesting reversal of the white-man-finds-enlightenment-in-exotic-lands trope, and although there is initially some humour in Adi’s shenanigans, the screenplay is too predictable and superficial to make this a memorable experience. Director Anand Surapur opts for a naturalistic storytelling style, which can be appealing when complemented by substantial writing. In the absence of depth though, it translates into lack of energy. Adi is played by Farhan Akhtar. In The Fakir of Venice, he is the exact combination that has made him a star via other films: charismatic enough for his acting limitations to be overshadowed by his attractiveness. Annu Kapoor manages to eke out moments of sensitivity in the wafer-thin writing of Sattar Ali. You want to feel more for him though, but there is just not enough of Sattar beyond a sketchy outline and the actor’s investment in the character. Former Channel V veejay Kamal Sidhu has a fleeting role as Adi’s ex-girlfriend but is given short shrift as much as everything else in the film. 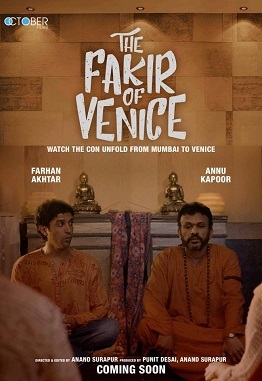 In terms of visuals, The Fakir of Venice is pretty, but it fails to fully exploit its setting, considering that Venice is one of the world’s most beautiful locations.